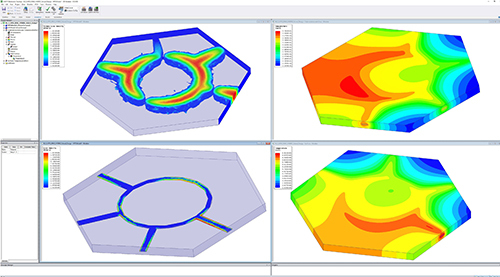 Microwave Journal asked some of the leading EDA software companies to describe their respective holistic approaches that help design engineers optimize across multiple tools, to accomplish high performance, reliable designs quickly and efficiently. Here are some comprehensive platforms that can accomplish multiple design tasks in one interface or environment to rapidly get your designs to market. Altair FEKO, Part of HyperWorks Platform, Altair, Troy, Mich.
Altair’s vision is to transform design and decision making by applying simulation, machine learning and optimization throughout product lifecycles. This is achieved by a combination of simulation software within the HyperWorks platform of innovation, complemented by software related services and consultancy offerings. Engineers are able to accelerate next-generation mobility solutions to meet the challenges of e-mobility development. From smart control design to powertrain electrification and vehicle architecture studies, these solutions enable optimization throughout the development cycle. Altair FEKO, a computational electromagnetic (EM) software aimed at telecommunications, automobile, aerospace and defense industries, is an integral part of HyperWorks suite. FEKO offers several frequency and time domain EM solvers under a single license. Hybridization of these methods enables the efficient analysis of a broad spectrum of EM problems, including antennas, microstrip circuits, RF components and biomedical systems, the placement of antennas on electrically large structures, the calculation of scattering and the investigation of electromagnetic compatibility (EMC). FEKO also offers tools that are tailored to solve more challenging EM interactions, including dedicated solvers for characteristic mode analysis and bi-directional cable coupling. 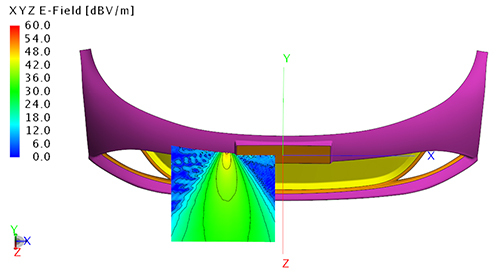 Special formulations are also included for efficient simulation of integrated windscreen antennas and antenna arrays. Combined with the multilevel fast multipole method and the true hybridization of the solvers, FEKO is considered a market leader for antenna placement analysis. One of the most notable features of the recent 2018 release is the inclusion of WinProp with FEKO as part of the standard HyperWorks installation. WinProp is a dedicated tool for wave propagation modeling and radio network planning interfacing with FEKO. WinProp’s accurate and fast empirical and deterministic propagation models are available for a wide range of scenarios: rural, urban, indoor, tunnel, vehicular (see Figure 1). WinProp supports arbitrary transmitters including cellular and broadcasting sites, satellites, repeaters and leaky feeder cables. WinProp’s propagation engines include empirical and semi-empirical models (calibration with measurements possible), 3D ray tracing models, as well as the unique dominant path model. Besides the prediction of the path loss, the delay and angular spread can be computed, as well as LOS/NLOS, directional channel impulse response, angular profile and propagation paths (see Figure 2). Figure 1 Path loss prediction in hybrid urban/indoor scenario. Figure 2 Full polarimetric analysis. A broad and deep technology offering: pre- and post-processing, different solver technologies, multiphysics coupling, strong focus on optimization technology, HPC integrations. Units-based subscription licensing model: all the Altair software tools including many third-party products in the Altair Partner Alliance, available under a uniform licensing scheme. Unique blend of software and services: complementing the software offering through consultancy that also helps Altair to understand customer needs for future software development. Figure 3 Adaptive Cruise Control (ACC) Radar System in a Bumper with Paint Layer. Characterized surfaces for the ray launching geometrical optics (RL-GO) solver greatly speeds up RL-GO analysis of complex multilayer structures (see Figure 3). Cable modeling extensions, including defining a reference direction for a cable path, providing precise control over cable orientation, instead of letting the solver search for the closest ground to the cable path. Numerous meshing improvements, including automatic meshing, which now yield different meshes for models, where the mesh size is governed by the geometry curvature rather than EM properties like frequency. Support for characteristic mode analysis without mode tracking across frequency. EM applications vary in complexity and electrical size, and no single numerical method can handle the entire range efficiently. By offering a selection of different solvers, FEKO users can choose the methods most suitable to the problems they are trying to solve, or use more than one solver for cross validation purposes. All solvers are included in FEKO as one package. ANSYS Electronics Desktop Platform, ANSYS, Canonsburg, Pa. 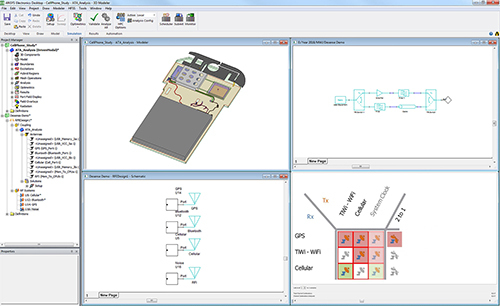 The ANSYS Electronics Desktop is a design platform created for the electrical engineer. It is a single interface for engineers to access the ANSYS physics solvers (HFSS, HFSS SBR+, Maxwell, Icepak, Q3D Extractor, SIwave) and circuit/system simulators (Nexxim, Simplorer, EMIT) with direct import of ECAD/MCAD geometry. In addition, the desktop includes direct links to the full ANSYS portfolio of thermal and mechanical solvers for comprehensive multiphysics analysis. With ANSYS Electronics Desktop, designers can integrate rigorous EM, thermal and mechanical analysis with system and circuit simulation in a comprehensive, easy-to-use design platform. 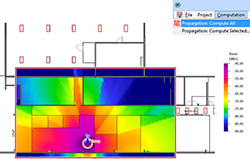 ANSYS HFSS is built in the ANSYS Electronics Desktop. The traditional MCAD interface is used by engineers to create 3D models, such as antennas, connectors, enclosures, lead frame IC packages and waveguides. The ECAD interface is for layered design as found in PCBs, IC packages and RF laminates. A unique feature is the desktop’s ability to mix MCAD with ECAD to create assemblies for wireless and electronic products with full 3D HFSS simulation accuracy. HFSS solvers, including the classic finite elements, integral equation, physical optics and shooting and bouncing rays (SBR), can be intermixed as multi-domain (hybrid) solutions to simulate from the electrically small to large in a single project (see Figure 4). 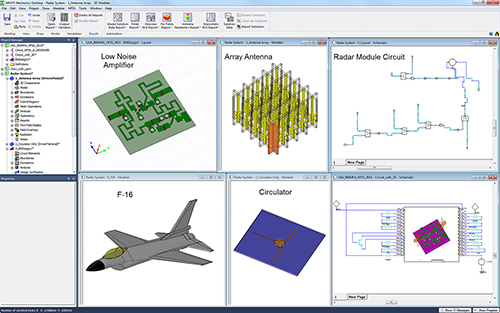 Figure 4 ANSYS Electronics Desktop is a powerful platform with the capability to combine multiple physics, circuits and systems into a single simulation such as the radar system depicted. The Electronics Desktop’s Solver on Demand technology enables engineers to combine EM simulators with circuit- and system-level simulations to explore complete system performance. Users can insert high frequency and signal integrity analyses into projects that co-exist, with drag-and-drop dynamic links between EM and circuit simulations, for simple problem setup and reliable performance. Working within a single interface, rather than moving back and forth between several different programs, eliminates the need to export data from one program to another. For example, users can insert VRMs, S-parameter elements or IBIS-AMI models into a circuit simulation very easily (see Figure 5). Figure 5 ANSYS Electronics Desktop integrates ANSYS HFSS calculated loss data with ANSYS Icepak to produce a temperature profile of a ring hybrid coupler. In addition to its multi-domain and multi-technology design capability, the ANSYS Electronics Desktop includes capabilities such as 3D component library models with encryption, assembly modeling and radio frequency interference (RFI) systems modeling. As communication systems push the limits of component size, weight and performance, engineers must adopt new technologies and smarter workflows. The resulting component engineering and associated intellectual property become increasingly valuable to the component developer and end-user. The ability to share accurate 3D design data among engineering groups while protecting this IP is critical to developing next-generation complexity in a practical manner. The patented 3D EM component technology is a breakthrough in model sharing, allowing engineers to create encrypted, password-protected user models that provide all the information to successfully design RF and microwave systems. 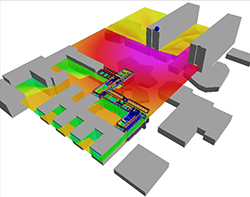 Predicting RFI in complex environments has become an essential part of the design process. The ANSYS Electronics Desktop integrates ANSYS EMIT for modeling installed antenna-to-antenna coupling. The result is a complete solution to reliably predict the effects of RFI in multi-antenna environments with multiple transmitters and receivers. EMIT’s powerful analysis engine computes all important RF interactions including nonlinear system component effects. These effects can produce high order intermodulation products that often lead to RFI. Diagnosing RFI in complex environments is notoriously difficult to perform in a testing environment, but with EMIT, the identification of the root-cause of any interference is rapidly accomplished via graphical signal trace-back and diagnostic summaries that show the exact origin and path that interfering signals take to each receiver (see Figure 6). Figure 6 ANSYS Electronics Desktop platform can predict RF interference and simulate radio de-sense in electronic devices. The ANSYS Electronics Desktop fully integrates world-class physics solvers with circuit and system solvers, patented encrypted 3D component libraries for data sharing and RFI prediction capability into a common platform. Using this design platform, RF/microwave designers will be successful addressing the next level of wireless product complexity and system integration.